Claudio Abbado, a conductor whose refined interpretations of a large symphonic and operatic repertory won him the directorships of several of the world's most revered musical institutions — including La Scala, the London Symphony Orchestra, the Vienna State Opera and the Berlin Philharmonic — died on Monday at his home in Bologna, Italy. He was 80. Raffaella Grimaudo, a spokeswoman for the Bologna mayor's office, announced the death without giving a specific cause, saying it followed a long illness. President Giorgio Napolitano of Italy paid tribute in a statement, saying Mr. Abbado had "honored the great musical tradition of our country in Europe and all over the world." Reviewing a Beethoven concert by the Berlin Philharmonic in New York City in 2001, Bernard Holland wrote in The New York Times: "Much-performed music needs different approaches in order to survive, and Mr. Abbado had his own. First, any sound worth making must be a beautiful one. Beethoven's rough surfaces are sanded and polished to a shine. The sweep of a melodic line takes precedence over the absolute clarity of inner voices." In the opera house, Mr. Abbado's repertory was similarly broad: He made his professional debut with Prokofiev's "Love for Three Oranges," in Trieste in 1958, and had successes with productions of Mussorgsky's "Boris Godunov" and "Khovanshchina." His repertory included Mozart and Wagner, but his specialties were Rossini and Verdi, whose music he performed with respect for the artistry they embody rather than the showmanship they allow, which he disliked. Like other opera conductors who came of age after World War II, he preferred to perform Verdi and other Italian Romantics in modern scholarly editions, in which opera house traditions like interpolated high notes were eliminated and material that had been cut was restored. In the mid-1970s, for example, he began to present the restored, five-hour version of Verdi's "Don Carlos." And his 1984 Pesaro Festival performance (and subsequent recording) of Rossini's long-lost "Il Viaggio a Reims" helped find that work a place in the repertory. Contemporary music was close to Mr. Abbado's heart as well. He maintained a fondness for the music of Schoenberg, Berg and Webern and championed new works by Luigi Nono, Krzysztof Penderecki, Goffredo Petrassi, Karlheinz Stockhausen, Pierre Boulez, Luigi Dallapiccola and Giacomo Manzoni. Mr. Manzoni's "Atomtod" — a piece performed entirely in the dark — was an early success for Mr. Abbado when he conducted it at the Salzburg Festival in 1965, and he gave premieres and made first recordings of several other modern works. After he was made general music director of the city of Vienna, in 1987, one of his first projects was to establish the Wien Modern festival. In 1980, it was widely reported that the Chicago Symphony had tapped him to succeed Georg Solti in 1982. It didn't happen that way; Solti remained on the podium for several more years. But in 1982 Mr. Abbado was named principal guest conductor in Chicago, a post he held until 1985. "In life every man has to take a position. When people say, 'Oh, he is a musician, why should he talk about politics?' this is stupid. I did a concert against fascism in Italy at La Scala. It was at the time of the election, and the fascists were very strong. In Italy, the opposition to fascism is communism, but it is not like it is in America. "I myself, however, belong to no party. I voted for the Communists simply because they were the opposition to the fascists. But I disagree with both Italian and Russian communism on many things. My line is very clear. I am for freedom. Everything that is not for freedom I protest." Claudio began his musical studies on the violin and piano with his parents when he was 8, but he quickly set his sights on the podium. The pivotal moment, he said, came during a performance of Debussy's "Nocturnes" by the orchestra of La Scala. He was further encouraged when Leonard Bernstein came to Milan in 1949 to conduct a performance in which Mr. Abbado's father was the violin soloist. Bernstein reportedly told the young musician that he had "a conductor's eyes." Back in Italy that same year, Mr. Abbado joined the faculty of the Parma Conservatory as a chamber music instructor. It was also in 1958 that he made his opera conducting debut in Trieste. He made his debut at La Scala in 1960, in a concert of works by Alessandro Scarlatti to celebrate the composer's tricentennial. He also organized a chamber orchestra of his own, Solisti di Milano. He was a truly great conductor and musician. He will be remembered! The world has lost a great musician, a wonderful soul, and a great Italian. 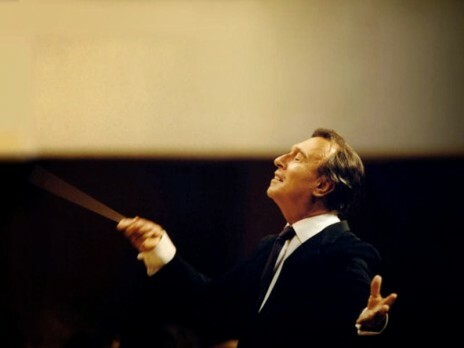 Mr. Abbado was named music director of La Scala in 1968 and held the position until 1986, when he became music director of the Vienna State Opera. He also made debuts at Covent Garden and the Metropolitan Opera in 1968, both in productions of "Don Carlos." In 1971 he was appointed permanent conductor of the Vienna Philharmonic and principal guest conductor of the London Symphony. He became that orchestra's principal conductor, succeeding André Previn, in 1979 and was its music director from 1983 to 1988. Mr. Abbado was enthusiastic about working with young musicians. In 1978 he founded the European Community Youth Orchestra for musicians 14 to 20 and toured with it several times. When some of the orchestra's musicians passed the upper age limit and decided to form a new orchestra, the Chamber Orchestra of Europe, Mr. Abbado signed on as artistic adviser and frequent conductor. Among Mr. Abbado's many honors were the Gran Croce, Italy's highest civilian honor, and the Legion of Honor from France. In Mr. Abbado's memory, La Scala said the orchestra, with Mr. Barenboim conducting, would perform the Funeral March movement from Beethoven's Third Symphony in the hall while it is empty, leaving the doors open, next Monday at 6 p.m. and broadcast it in the Piazza della Scala. "I used to be somewhat like that," he said. "Now I take the time to be polite. Look, I like the reaction of the audience. I'm not sincere if I don't say that, but it still embarrasses me to take bows. I'm not a showman."